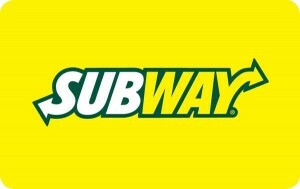 Buy Subway gift cards online at a discount to save money on casual dining. Subway is a fast food chain based on the principles of quality ingredients and good nutrition and offers a wide variety of sub sandwiches. The Subway menu includes breakfast sandwiches, gluten free options, the traditional meatball sub and the new Tuscan chicken melt. Subway makes each sandwich on the spot, so you can “eat fresh” 24/7. Shopping Tips: Subway gift cards do not expire and have no service fees, you can buy them now and use them whenever hunger strikes. Below is a listing of our favorite places to buy Subway gift cards. There are always great deals and discount available when buying these so check back often. We will keep this list updated to reflect the best rates when possible. Now you can “eat fresh” while saving money when you purchase one of our cheap, unused gift cards to Subway! If you love sub sandwiches or simply are trying to save money while searching for healthier fast food options, then this card is a must-have item. Get yours today and use it in store at Subway. Read more on Gift Cards Discount Rates.